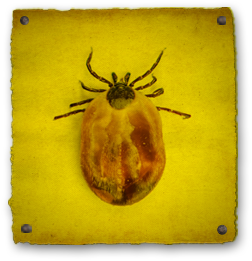 Ticks are found in grassy or brushy areas around the home. They attach themselves to people and pets as they move through these areas. Ticks do drop from pets inside the home. They will molt and wait to attach themselves to the next host. Inspect pets, pet bedding and their sleeping quarters frequently. Treat as necessary if ticks are present. When outdoors and tick activity is high, wear long sleeve shirts and pants, use personal repellents labeled to repel ticks. Seek medical or veterinarian assistance if tick bites become infected.